ITZY’s Ryujin was in an almost tell-all mode for the 12th episode of the band’s show on Naver’s V Live. Wearing a comfy checkered pajama she shared her many favorites, from her two pet cats to her recent hobby, taking pictures with a film camera. While naming her favorite food -- “I like spicy food … and anything with red bean paste. Walnut pastries! And meat and raw fish of course,” ?- she almost sounded dreamy when it came to mocha-flavored bread. She loves lounging in a sofa watching television catching up with movies all day if possible and when stressed out, she watches her go-to movie “Wallflower” to cry and fall asleep. Ryujin revealed that she is a big fan of snow and Christmas season showing pictures of a cute little snowman, with a flower on the top of the head, a Christmas tree she decorated with her bandmates, and herself baking cookies for the holiday. Watch the full clip at https://www.vlive.tv/video/119345. 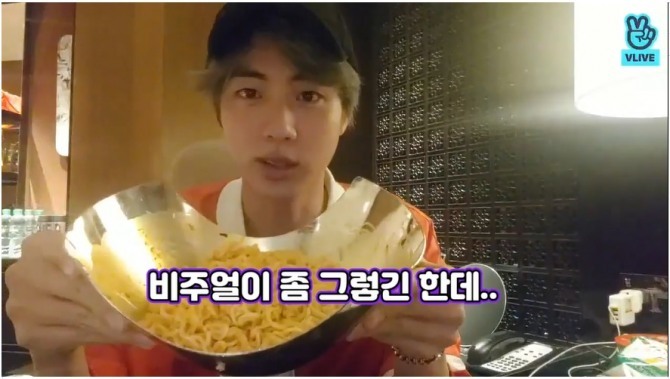 BTS’ eldest member Jin returned with a healthy appetite and a new vow on Naver’s V Live. Starting with a mixture of super spicy chicken noodles and cheese, he added his favorite is menu steak. Although he wanted a soda to gulp down the meal he settled with a bottle of orange juice when he could not find Coca Cola which his band endorses. “They only had the other brand,” he professed. Between bites, he went through the messages from fans revealing that keeping tags on his clothes was not a symbol of swag but simply because he is lazy. “Somebody spots them and gets rid of them,” he said innocently. Jin went on to say that he also is not diligent enough to go around shopping. “It’s not like I am crazy about this certain brand. They do have nice collection and when I need some clothes, I just go there and pick up several and come straight back home,” admitted the idol by way of explaining his seeming loyalty to an apparel brand BTS models for. From now on, though, he may start buying himself more clothes and spend less on his game avatars, he added. Watch the full clip at https://www.vlive.tv/video/119413. 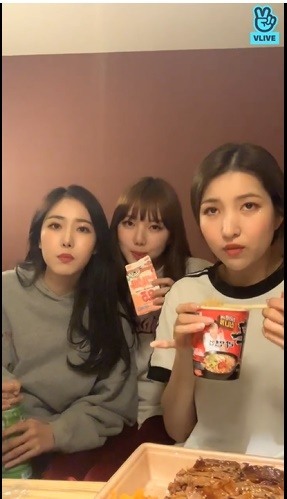 GFriend’s Sowon went live while eating a meal during their visit to Japan on Naver’s V Live. Sowon was having a hard time trying to unlock the electric pot for her instant ramen when the younger member popped in. With her help the leader could enjoy her meal: beef bowl and Pollock roe which Yerin highly recommended. SinB joined in later with wide eyes at the sight of the fish roe. Sowon generously shared her food with SinB before they enthused together over Sam Kim. The bandmates admitted that separate rooms for each member may give them privacy but they could also be lonely. “It felt as if I didn’t have anything to do … The only thing I did was talking to my parents. Through a pet cam!” laughed SinB. The girl group went live in front of their fans in Tokyo and Osaka earlier this month. Their second single in Japan titled “Sunrise” has been a hit and the group has been chosen as one of the “Best 3 New Artists” by Japan’s Gold Disc Awards last month. Watch the full clip at https://www.vlive.tv/video/119391. 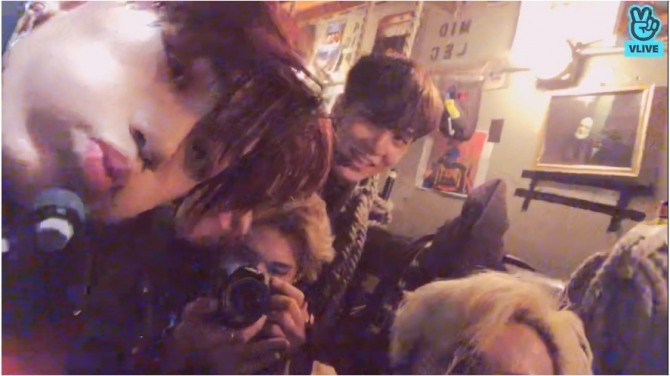 Members of Ateez shared their excitement and wild moment logging on to Naver’s V Live between songs of their live performance in Chicago. Members of the boy band were covered with sweat and panting heavily but were all smiles as they reported to fans who could not come to their first tour in the US. “Do you hear the sound?” marveled the boys at the screams of local fans chanting the group’s name. The group debuted in October last year and has kicked off the tour in Los Angeles a week ago traveling to Dallas and Chicago before heading to Dallas and New York. In April, they will fly to Europe and perform in 10 cities starting in London and hit all the major cities and wrap up the tour in Moscow. Watch the video at https://www.vlive.tv/video/119446.